Tribhuvan University, Controller of Examination office Balkhu published the result of BA LLB Second Year. Students and colleges can view their results online using different sites. 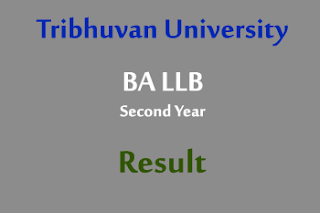 And BA LLB Second Year Result also available through IVR. Check details method below for TU BA LLB Second Year Result Published. Click Here to check using edusanjal - For Students. Click Here to check using edusanjal - For Colleges. Click Here to check using Nepal Telecom's official site. Dial 1602 from NTC and follow instructions to check your BA LLB Second Year Result. - Goto Message Box on your mobile. - Send the message to 34949.